Does your life seem complicated? It doesn't have to be. 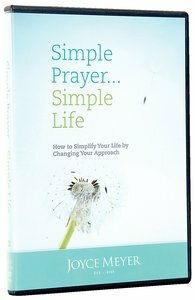 There are some things you can do to simplify your life, and the first step is inviting God into everything you do. He cares about you deeply and has your best interest at heart. He sees things you can't see and will help you make the wisest decision in every situation you face. * How to avoid being overcommitted. If you're frustrated, aggravated, and overwhelmed with everything that's 'on your plate', then it's time to make some changes. Life isn't necessarily going to change, but you can change your approach to life. Discover a new way of living by trusting God more and leaning less on your own ability and understanding.